The art of knowing when to walk away, and the courage to take that step even at the risk of emotional pain or discomfort can be one of the most empowering experiences. Siddhartha Gautama the founder of Buddhism, was a prince born into great wealth and luxury. He lived a sheltered life and was never exposed to the suffering of the world, a world he did not know. He was not aware of pain, suffering, poverty, sickness or depravity on any level. At some point he desired to give up all he knew and owned in order to experience the world beyond his castle walls. For the first time in his life he saw suffering and was shocked at his discovery. However, this led to his spiritual awakening and he was able to become spiritually wealthy as a result. Such a profound effect did his act of walking away from his former life have that an entire religion – Buddhism – was founded on the principals of his spiritual awakening and awareness. We often allow ourselves to remain trapped in a situation that no longer serves us, be it a toxic relationship, an unfulfilling job, or a less than perfect location. Letting go is seldom easy however unless we are willing to leave our comfort zones when we know that the current situation is not what we want, we cannot begin moving into the direction of attracting what we DO want. It may be the subconscious belief that we do not really deserve fulfilment and complete happiness that keeps us trapped in negative or toxic situations. Or, perhaps we are not yet consciously aware that we attract ALL things to us, the so-called good and bad. Things do not just randomly happen to us. Everything that we manifest, without fail, is rooted in the choices we have made, whether consciously or subconsciously. Many of us do not yet realize the extent of the power that we have over our lives. Most of us do not ‘remember’ or understand the value of the lessons of less desirable situations and elements that we have attracted and manifested into our lives. But, until we do, we probably will not understand that it is equally within our power to attract its opposite. There are no good or bad situations from the point of view that even uncomfortable situations serve as contrast to demonstrate what it is that we don’t want to manifest in our lives. And often it is in the realization of what we don’t want that we gain clarity about what we do want to manifest instead. Every time we become uncomfortable about an aspect of our lives we project a desire to attract its opposite. When this desire becomes so strong that we can almost no longer bear the current dissatisfactory situation we are often ready to act upon it by letting go and allowing the process of attracting what we DO desire instead. Letting go of old beliefs that no longer serve us, walking away from beliefs that have kept us trapped in the illusion that we are powerless to change those aspects of our lives that we no longer desire, takes courage. It is the path less travelled. It is also the path that always leads to greatness. 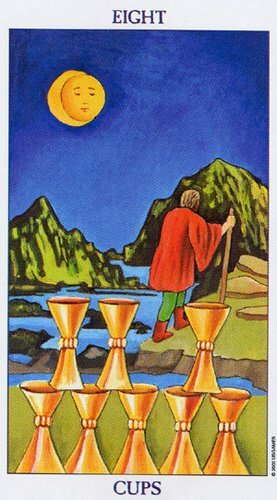 As we contemplate letting go of certain elements of our lives and taking a new direction on our life’s journey I will end today’s Tarotelic with an old Irish blessing to pave the way.